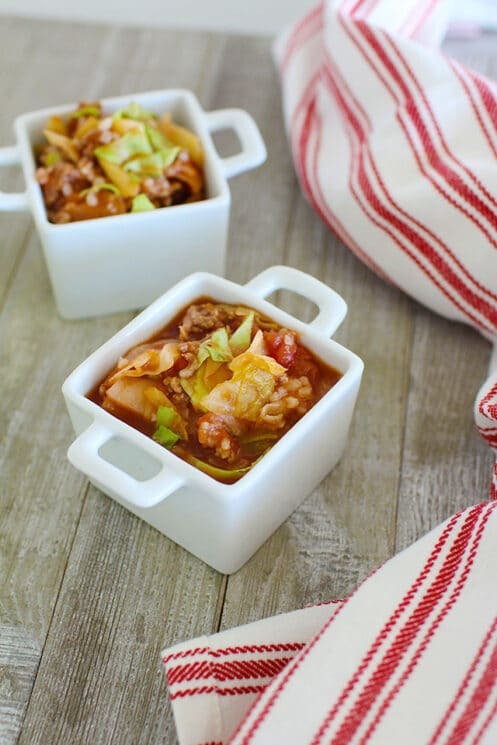 Stuffed Cabbage Soup made with savory ground beef, hearty cabbage and zesty tomatoes make this a comfort soup packed with nutrition. 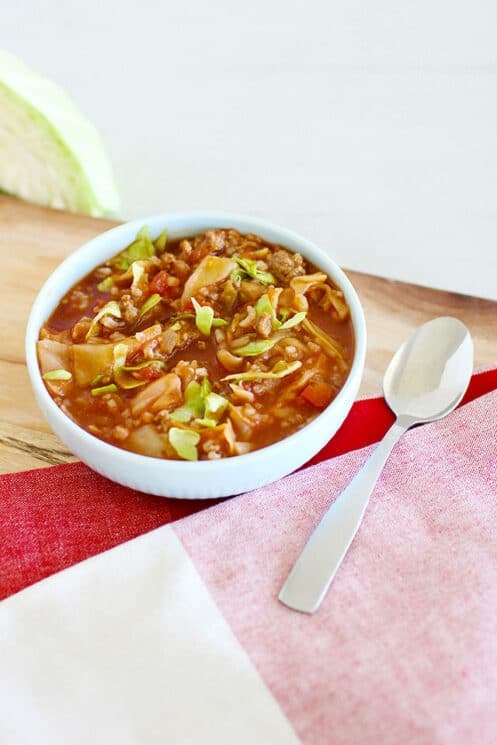 How Do You Make Amazing Cabbage Soup? 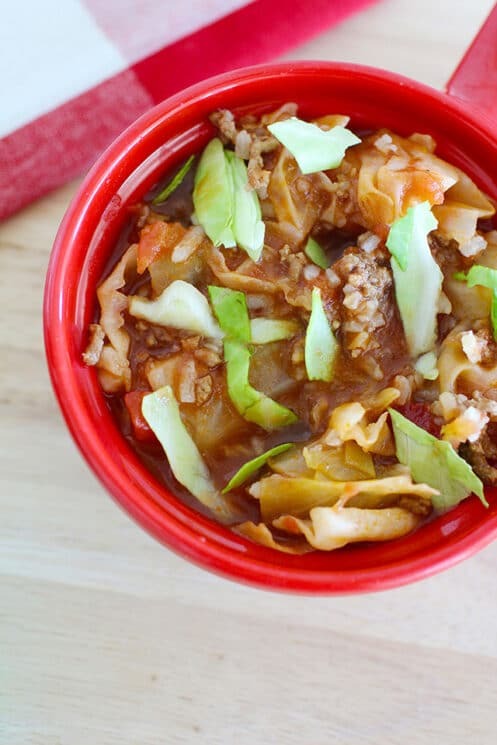 Regular cabbage soup has been thought for years to help with weight loss. That may be true because just cabbage and water have very little calories. But cabbage does have a lot of nutrition and we wanted a soup that was filling, comforting and tasted amazing with the benefits of cabbage. Thus was born stuffed cabbage soup! To make a really good soup, you have to build flavors as you go. Veggies like onion, garlic, celery and carrots are the base of a lot of different kinds of soups. The reason being these veggies are known as aromatics and release flavor as they are cooked. Make sure they are cooked long enough to soften and release their flavors before moving on to the next step. Don’t over salt. A lot of soups call for broth or stock that have plenty of sodium – also canned beans, tomatoes or sauce and paste have a lot of salt. Wait to add most of your seasoning at the end, and then taste and adjust with salt and pepper. A medium sized cabbage yields about 6-7 cups of sliced cabbage. If you have more than that and want to use it, just make sure you add a bit more liquid to compensate. If you want to kick up the flavor a notch, add a splash (2-3 teaspoons) of apple cider vinegar. If you feel like the soup needs a little balance, you can squeeze just a tiny bit of honey into the soup. Why is Cabbage Good for You? Cabbage looks like lettuce, but it is actually in the same family as broccoli, cauliflower and kale. It comes in a variety of shapes and colors – red, purple, white and green. Nutrients: High in Vitamin K, and C. Cabbage is also high in antioxidants that help your body fight disease. Cruciferous veggies like cabbage contain a lot of different antioxidants that have been shown to reduce chronic inflammation. This crunchy veggie is full of insoluble fiber which keeps kids digestive system healthy by adding bulk to their poop and helps keep them regular. 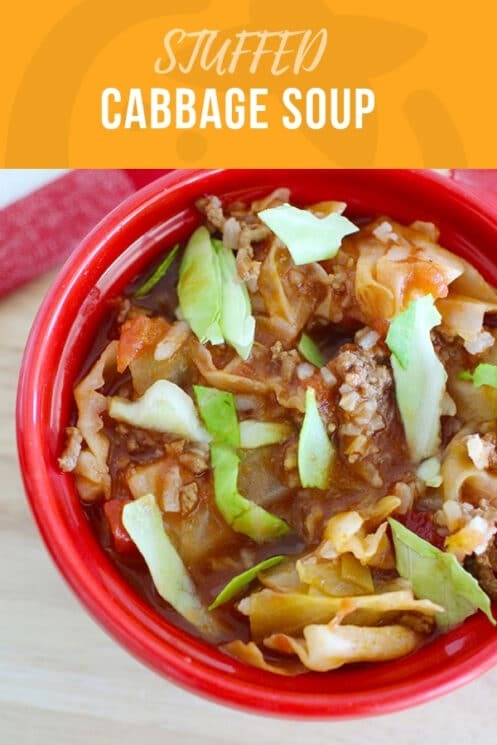 Because there are so many types of cabbage, it is a vegetable that is easy to add to lots of different foods like salads, soups, (like this Stuffed Cabbage Soup) and slaws. Also it is incredibly inexpensive making it a good choice to add a little more to your meals for not much cost. Want to add more cabbage to your kids diets? Try some of these delicious recipes! Cook rice as directed on package; set aside when done. Heat dutch oven over medium heat. Add beef and season with salt and pepper. Cook for 6-8 minutes or until cooked through. Stir and break apart into crumbled. While beef cooks, dice onion and chop cabbage into bite size squares. Once beef is cooked and no longer pink, remove from pan. Add butter, onion, and cabbage to dutch oven. Cook for 3-4 minutes until slightly browned and cabbage is wilted, stirring occasionally. 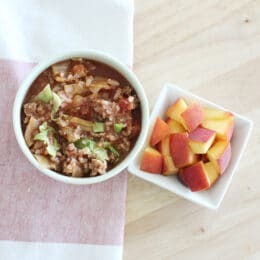 Add beef, diced tomatoes with juices, crushed tomatoes and beef broth to the pot. Simmer for 15 minutes. Add rice, stir and allow to heat through. What is the serving size on the cabbage soup ?